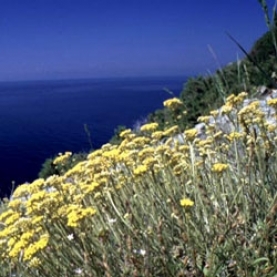 Helichrysum italicum Hydrosol, like the essential oil, has many, many uses. Also known as Immortelle or Everlasting. One of the most powerful anti-inflammatory hydrosols. Helichrysum italicum hydrosol is a strong anti-hematoma just as Helichrysum italicum essential oil. It is, however, not as analgesic as the oil. Suzanne Catty states, "Applied in a compress to bangs and bumps, it can even bring subcutaneous bruises to the surface, exposing hidden damage." As well as being significantly anti-inflammatory, it is extremely cicatrisant for all wound and tissue damage.